A little secret? There are many cheap things to do in Pigeon Forge, TN! Save money on your next trip to Pigeon Forge and the Smoky Mountains with discounts, coupons and free things to do. There are so many ways you can save money while still enjoying your Smoky Mountain vacation, we would love to share our tips with you and see you return to our beautiful city again and again. Save money now with Pigeon Forge coupons. You will find a variety of savings including lodging options, entertainment and shopping. Also, check the coupon racks where you are staying and ask the front desk staff for recommendations, deals & packages, and specials for groups. Every month we update this page with the current top deals on attractions, hotels, cabins, restaurants, and more. Bookmark it and check regularly for new additions to the list. If you are coming with a large group of people, save money by renting a big cabin and planning for attractions with group discounts. 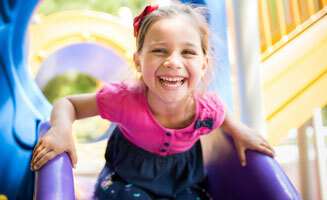 Renting a cabin is an affordable lodging option for bringing the whole family on vacation. Save money by hitting the local grocery store and cooking in your cabin as well as carrying snacks and your water bottle while out and about to avoid pricey snacks and drinks. We have an entire archive on ways to save money in Pigeon Forge. From budget friendly activities for kids, families, and groups, to free things to do for all ages, to hotels that will allow you to layaway your vacation, you'll find loads of helpful tips in our blog archive. Vacation packages will save you money, it’s as simple as that. When you bundle your lodging, attraction, and theater tickets, you can save a bundle! Park your car and ride Fun Time Trolley. 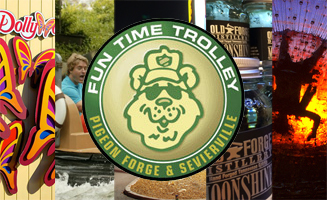 The Pigeon Forge Fun Time Trolleys are an easy and affordable way to get around the city. Traffic lights are numbered which makes for easy directions. Park and ride to Pigeon Forge, Gatlinburg, and Sevierville. Check out hotels on the parkway to stay right in the middle of the action and get where you need to go fast. If you're staying in a hotel, take advantage of the continental breakfast if available to save some money on your vacation in Pigeon Forge. Many hotels offer complimentary Continental Breakfast to their guest as an incentive. A typical hotel breakfast includes breads, pastries, pies, croissants, fruit marmalades or jellies, butter, cheese, fruit juice and hot beverages. Did you know we run regular contests and giveaways several times a year? 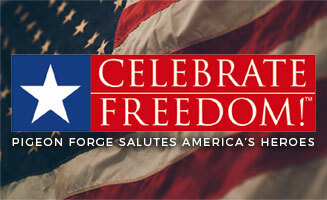 We've given away thousands of dollars in gigantic prize packages for complete vacations to the Pigeon Forge area. You can check out our contest archive to see what people have won in the past, and be sure to follow us on Facebook and sign up for our newsletter to find out as soon as a new contest opens.